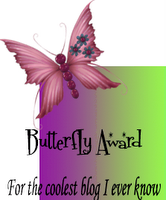 I received a Cool Blog Award from Julie of Julie's Blog. She gave me this award before Thanksgiving, and today something made me remember it. I am supposed to give this award to ten more bloggers, so I'm just going to give the award to all of you that are listed over in my Favorites. It would be hard to just choose 10 of you. So do a right click and put this award on your blogs and then link back to mine. Thank you Julie!!!!! It has been so long since my last post that you probably thought that I fell off the face of the earth. My hubby had hernia surgery a little over a week ago, and I've just been busy trying to get caught up with Christmas. I just finished knitting these fingerless gloves for a Christmas present. The yarn is a Trendsetter Yarn called Merinos Otto Shadow. This is the third pair of these gloves I've made. If you are a knitter and haven't tried cables, they are really pretty easy for as complex as they look. This is my first pair done in the same yarn but a different colorway. I finished these socks out of worsted weight yarn awhile ago. They are reallly warm..I've worn them and they are great for winter. This is a fabric pack that I bought in Shipshewana. It is called Metro Blue Gone Green. I think this pack has 5 yards of fabric and I have 3 other fabrics from this line. Now I just need to come up with an idea of what to do with it. Any ideas?